With Max Payne 3 just around the corner, I decided to take the sequel to the original cult classic for a spin once again. Does it still hold up so many years later? The short answer is yes! For the long answer, keep reading. Max Payne 2’s focus is on Mona Sax, femme fatale and sniper master. As Max chases after her, in an attempt to learn what the hell is going on, he delves deeper into a web of despair, lies, violence, and a battle with his own inner demons. Max Payne 2’s story was groundbreaking for its time. The use of graphic cutscenes mixed with in-game motion capture, and a gritty, noir-inspired storyline made it for a compelling twist on the shooter genre. However, I personally found the story confusing at times, not really sure of what was going on. However, this is made up for by the fact that, for one, this is in part supposed to be happening, and secondly, the interactions between Mona and Max are amazing. It is a very believable, very interesting love story, and they both definitely grow on you by the game’s end. But in between Max and his fleeting moments with Mona are hundreds of enemies that have to be taken care of. Thankfully, doing so is an absolute blast. The gunplay in Max Payne 2 is tight, fast paced, and fun. Max has access to a variety of weapons, some of which can be duel-wielded. And then, there is the game’s signature bullet time, as inspired by John Woo’s work. With the press of a button, Payne can slow down time in order to fire off a multitude of accurate shots. Which each kill, time slows down further, to the point that bullets from long range can simply be side stepped. 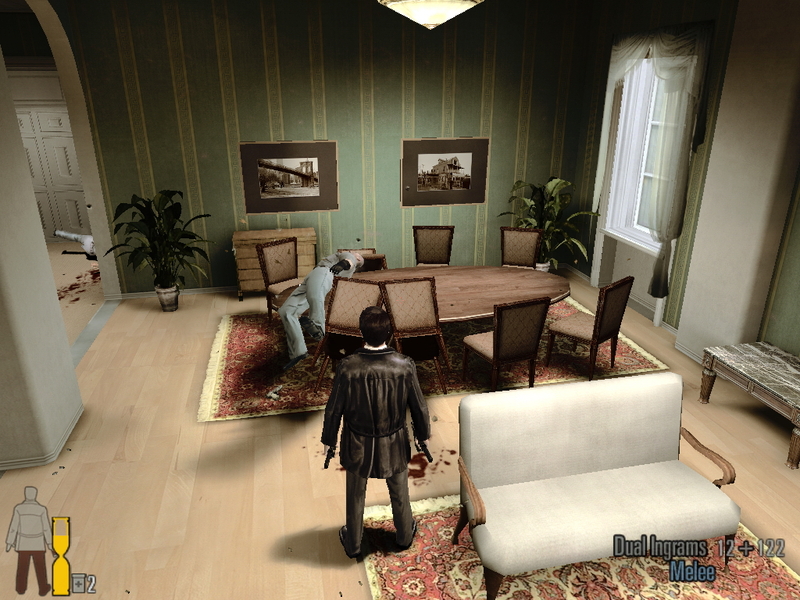 Each kill also adds time to the hour glass that indicates how long Max can stay in bullet time. A great change from the first game is that when Max dives to the ground, it does not take away from the hourglass. Also added is an awesome 360 flourish Max does whenever he reloads mid fight. This all adds up to a very cool, very unique addition to what could have been a standard shooter. All this shooting is very pretty to look at as well. Max Payne 2’s graphical detail may be a little set back compared to this day and age’s graphics, but it’s strength is in its impeccable level design. Every level is unique in design, and memorable in its own right. The atmosphere is dark and brooding, and accentuates the noir style Max Payne 2 is shooting for (Pun entirely intended). This is complemented by the incredible voice work by all the characters of the story. Max especially takes the cake in this regard, his monologues having an impact that could only be recognized via the spoken word. All in all, if you haven’t looked up Max Payne 2 yet, give it a try: It is definitely worth it. Though the campaign is a little short, it makes up for this with a tightly woven story, and great gunplay. Max Payne 2 was loved by many, including Empty Wallet Gamer. If you haven’t played Max Payne 1 or 2, are you looking forward to Max Payne 3 still? If you have played these games, what is your favorite thing about them?